The energy-saving benefits of less excess air — Stevie O’Neill. Stevie O’Neill of EOGB Energy Products Ltd, looks at the effect that new heating technology such as O2 and CO trim has on the efficiency of commercial heating systems and the benefits of automatic trim control. Combustion efficiency is an indication of a burner’s ability to burn fuel completely and is assessed by measuring the amount of unburned fuel and excess air in the exhaust. Burners resulting in low levels of unburned fuel whilst operating at low excess-air levels are considered to be the most efficient (negating stack temperature as this is termed thermal efficiency, which is not the same as combustion efficiency). It is possible to experience burners firing gaseous and liquid fuels whilst producing excess air levels of around 25% and resulting in negligible quantities of unburned fuel (depending upon the burner/boiler match). Well-designed ultra-low-emissions burners operate at a lower excess-air level of around 15%, resulting in greatly reduced emissions. By operating at the minimum excess-air requirement, less heat from the combustion process is used to heat excess combustion air, which increases the energy available for the load as well as reducing the quantity of fuel required to raise the process temperature. This can also be responsible for reducing the production of harmful emissions such as NOX into the atmosphere. CO and O2 measurement panel. Under normal operating conditions, the combustion engineer will typically set up the burner with sufficient excess air to ensure that it will not become starved of combustion air and begin to cause incomplete combustion. Several factors can have an effect on the combustion process over time. • Barometric conditions. Atmospheric temperature can affect the density of air and have a bearing upon the fuel/air mixture. Altitude can also alter the quantity of oxygen within the combustion air. • Calorific value. The calorific value of a fuel can change from time to time and, as with the barometric conditions, have a bearing on the fuel/air ratio that is required. • Mechanical hysteresis. Depending on the type of burner, it can be possible for the original burner settings to drift away from their original settings due to continuous operation. It then becomes necessary to introduce more air than that which is required for complete combustion, but this inevitably incurs a deleterious effect on overall combustion efficiency. As it is not cost-effective to have constant monitoring from an engineer, it is possible to incorporate a constant monitoring system into the burner control, such as oxygen trim. Oxygen-trim (O2) systems gather the amount of oxygen present in the stack via a digital or analogue feedback system and then search for the optimum working point of the appliance near its emission edge. The system can then adjust the burner equipment accordingly via an interpolation, thus maintaining combustion quality, optimising further if necessary, and monitoring. This procedure is repeated cyclically so that the optimum working points are always maintained even for unfavourable weather and system-related conditions. A good oxygen trim system will ‘learn’ during commissioning what the effect is to the burner for every single trim that it performs. This allows for full-time oxygen-trim operation without the necessity of a full-time plant operator, irrespective of how the plant conditions change. 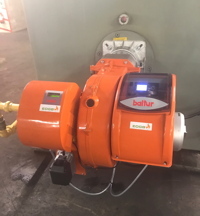 A Baltur BGN 300ME burner is installed at a large commercial premises. Although oxygen-trim technology can make significant savings if applied correctly, it can be further improved with the introduction of carbon-monoxide (CO) trim. It should be noted that the sensors employed in this application do not actually detect CO. In fact, they are more reactive in detecting the other substances produced when combustion is incomplete, and it is therefore necessary to refer to the sensor as the COe (carbon-monoxide equivalent) sensor. The COe sensor is identical to the oxygen sensor apart from the electro-chemical and catalytic properties in the signal materials being different, thus enabling combustible components such as carbon monoxide and hydrogen to be detected. In the event of incomplete combustion, and in the presence of unburned hydrocarbons, a non-Nernst voltage U COe also forms on the COe sensor. The characteristics for both sensors alter and relay a signal to the control module to adjust the burner as necessary. This process is identical if an excess of oxygen in the atmosphere exists. Close to the emission edge, the sensor signal for the COe electrode U CO/H2 increases at a disproportionate rate due to the additional non-Nernst COe signal and searches for the optimum working point of the combustion, adjusting this and optimising combustion further. This procedure is repeated cyclically so that the optimum working points are always maintained, even for unstable barometric conditions, mechanical hysteresis or fluctuating calorific values. O2 and CO control can achieve useful savings. The excess air in this boiler plant using burner type BGN300ME was reduced from 25% down to 8%. 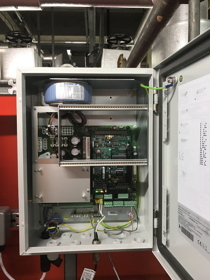 EOGB recently installed an O2/CO control system at a large commercial building in the North of England which has never employed any combustion monitoring equipment. The excess air was reduced from 25% down to 8%. The increase in overall combustion efficiency can be interpreted as potential financial savings for the client. The results identify that the combustion was taken far closer to the emission edge than would be possible without the use of such a control system. The table shows the potential savings that could be made (per burner) at the site over a 12-month period with the implementation of O2 and CO control technology. Stevie O’Neill is technical specifications engineer at EOGB Energy Products Ltd.